The American Hospital Association (AHA), the Federation of American Hospitals (FAH), and the American Society of Health-System Pharmacists (ASHP) released a new report finding that continued rising drug prices, as well as shortages for many critical medications, are impacting patient care and putting strains on hospital budgets and operations. The report was prepared based on analysis conducted by NORC at the University of Chicago, an independent research institution. This report updates and expands on a previous AHA/FAH report from 2016 on skyrocketing inpatient hospital drug cost increases by also analyzing outpatient drug costs and the impact of drug shortages. The report found that hospital budget pressures resulting from the continued dramatic increases in drug prices have negative impacts on patient care, with hospitals being forced to delay infrastructure investments, reduce staffing, and identify alternative therapies. Hospitals also struggle with drug shortages, which can disrupt typical work patterns and patient care, and often require significant staff time to address. Average total drug spending per hospital admission increased by 18.5% between FY2015 and FY2017. Outpatient drug spending per admission increased by 28.7% while inpatient drug spending per admission increased by 9.6% between FY2015 and FY2017. This 9.6% increase was on top of the 38% increase in inpatient drug spending between FY2013 and FY2015 included in the previous report. Very large percentage increases (over 80%) of unit price were seen across different classes of drugs, including those for anesthetics, parenteral solutions, and chemotherapy. Over 90% of surveyed hospitals reported having to identify alternative therapies to manage spending. One in four hospitals had to cut staff to mitigate budget pressures. 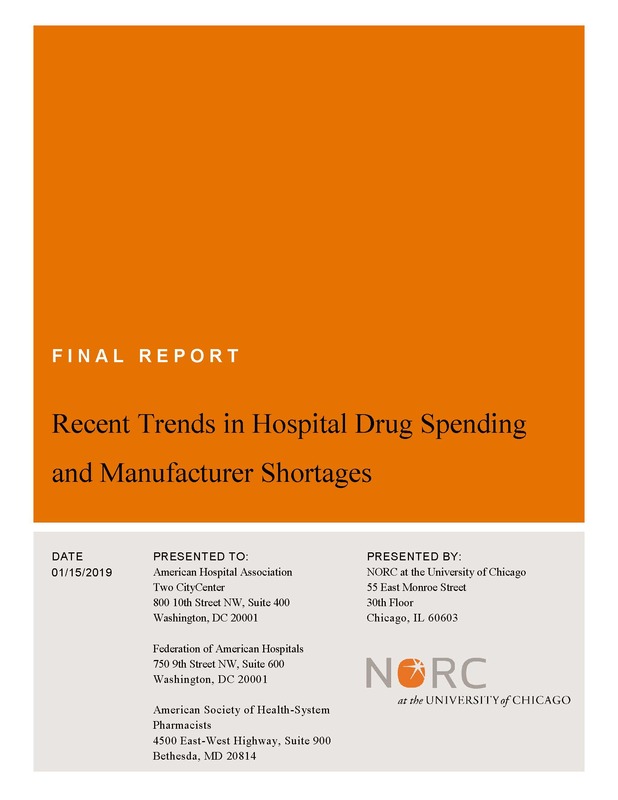 Almost 80% of hospitals found it extremely challenging to obtain drugs experiencing shortages, while almost 80% also said that drug shortages resulted in increased spending on drugs to a moderate or large extent. 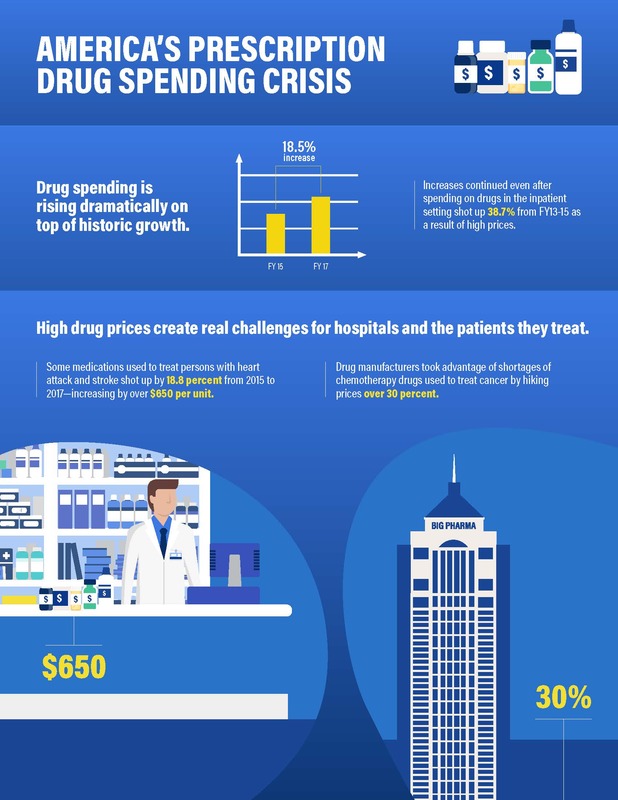 View the America’s Prescription Drug Spending Crisis Infographic. View and download the Recent Trends in Hospital Drug Spending and Manufacturer Shortages PDF. View and download the America’s Prescription Drug Spending Crisis Infographic.